I honestly couldn’t be more excited to share this Vegan Stretchy Melty Grilled Cheese. 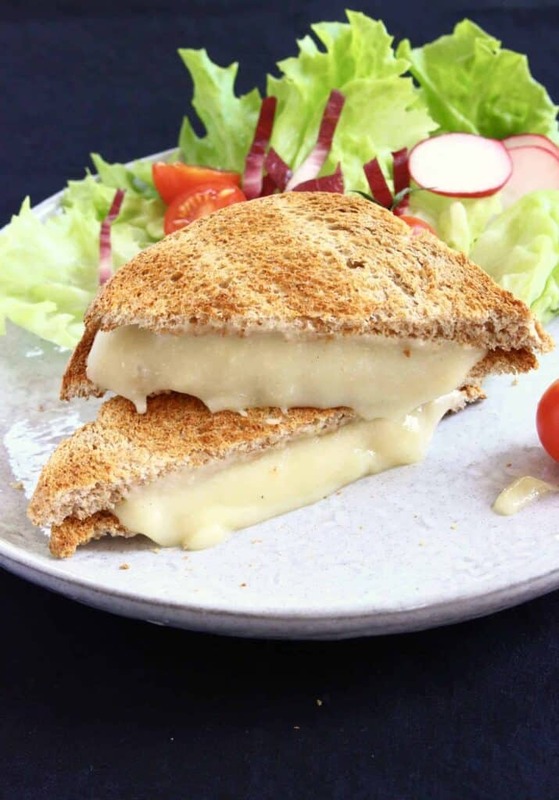 I’ve experimented with vegan toasted sandwiches in the past, but hadn’t tried making anything with “cheese”, as I didn’t think anything would measure up to the melty, stretchy phenomenon that is real melted cheese! I did consider using something like tofu ricotta or cashew cheese, but didn’t like the fact that I knew it wouldn’t melt properly like normal cheese. I wanted to create something using entirely natural, neutral-tasting ingredients that I could use as a base for adding more flavours, and of course something that would have that essential melty, stretchy texture. It seemed impossible at first…then I started thinking about mochi…mochi are Japanese sticky rice cakes, which are made from pounding rice until it becomes sticky and glutinous (don’t worry, despite the name it is still gluten-free). It is sold in many different forms, one of them being in small, hard blocks. When these blocks of mochi are melted, they become incredibly sticky, stretchy and gooey…like real cheese! 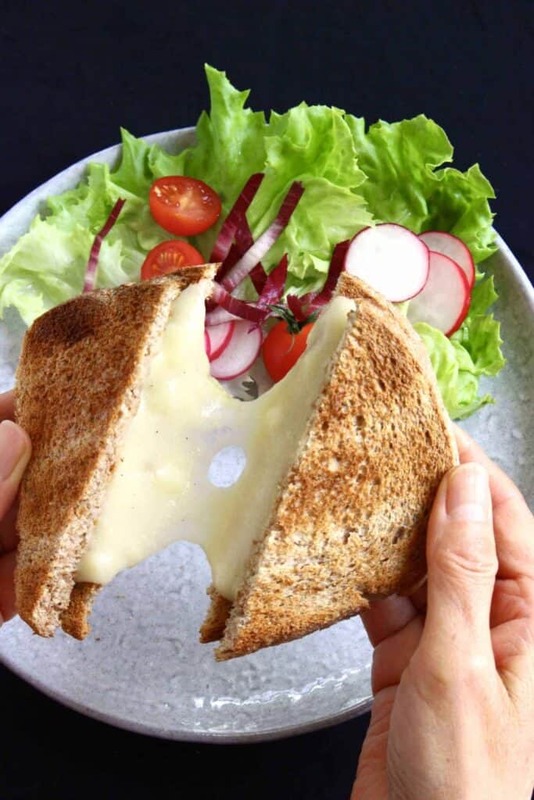 And that was when I realised that melted mochi would be my magical secret ingredient – the perfect thing to create a Vegan Stretchy Melty Grilled Cheese! You can buy mochi in Asian supermarkets, some local health stores, or online – just make sure you get the hard, firm type that’s sold in blocks. One word of caution: melted mochi is extremely sticky, so once you have removed the sauce from the pan, please soak your pan in boiling water immediately – otherwise you’ll have a very tricky washing-up situation on your hands! 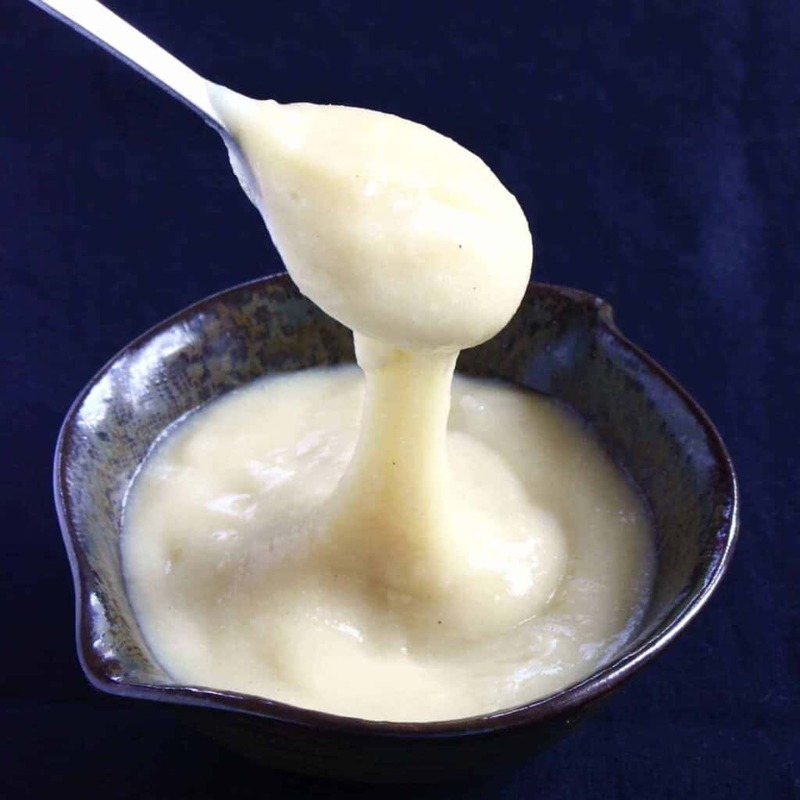 But obviously I knew I couldn’t rely on mochi alone…and so I decided to add some boiled potatoes, which also become extra starchy when blended, also contributing to the overall stretch factor of the cheese. Amusingly, the idea to combine mochi with potatoes to create a melty, stretchy vegan cheese came from my Japanese grandmother. She always used to make these things called imomochi, which are these savoury mochi “cakes” made with potatoes – the texture is naturally melty, sticky and stretchy, just like the dairy-free cheese that I was after! In terms of flavour, you can’t really get any more bland than mochi and potatoes, which means they’re the perfect ingredients for vegan cheese, because they work as a great base for adding other flavours. Just like with my Vegan Mac and Cheese, I decided to flavour the cheese with miso, which adds an umami-rich, salty, fermented flavour, nutritional yeast for cheesiness, and a touch of vinegar for a slightly sour cheddar-like flavour. Incidentally, all of the ingredients I used happen to be oil-free and nut-free too! I was a bit worried that using potatoes and mochi to make a cheese to go between two slices of bread would mean the whole thing would be far too starchy and heavy, but it surprisingly doesn’t taste overly starchy at all. I think the contrasting textures of the crisp toast and the gooey cheese prevents this. 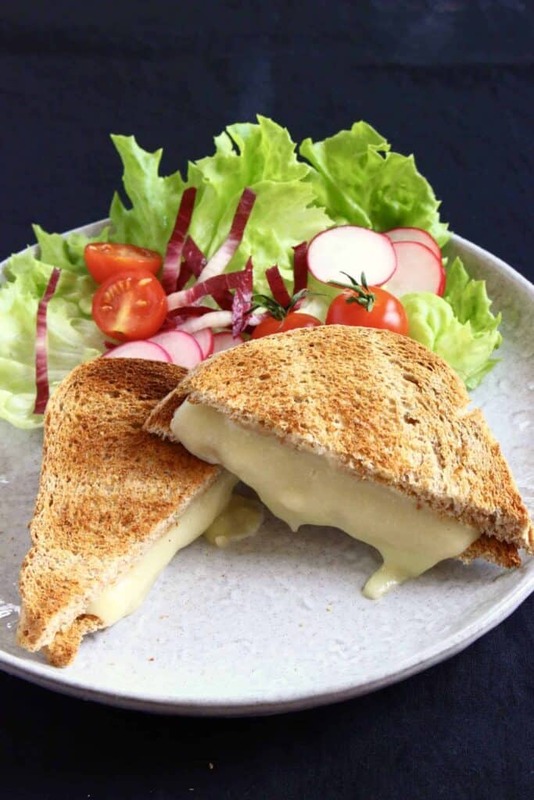 However, if you’d like to make this grilled cheese a little healthier, you can use white beans instead of potatoes – I’ve tested this too and it’s equally delicious, more nutritious and has more protein + fibre too. I’ve included both options in the recipe below. 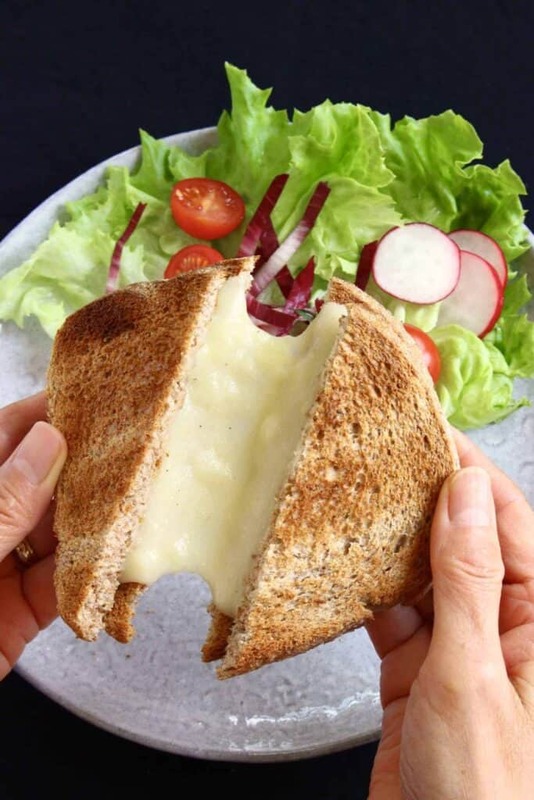 Obviously as this particular grilled cheese requires cooking potatoes and mochi first and then blending them, it’s a little bit more effort than your classic grilled cheese…but, if you’re dairy-free and missing cheese, you really gotta try it! Also, a big batch keeps well in the fridge for up to a few days – just pop in the microwave or reheat on the stove before using. 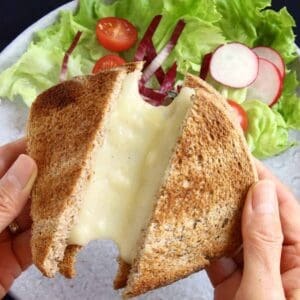 I really hope you’ll love this Vegan Stretchy Melty Grilled Cheese as much as I do! 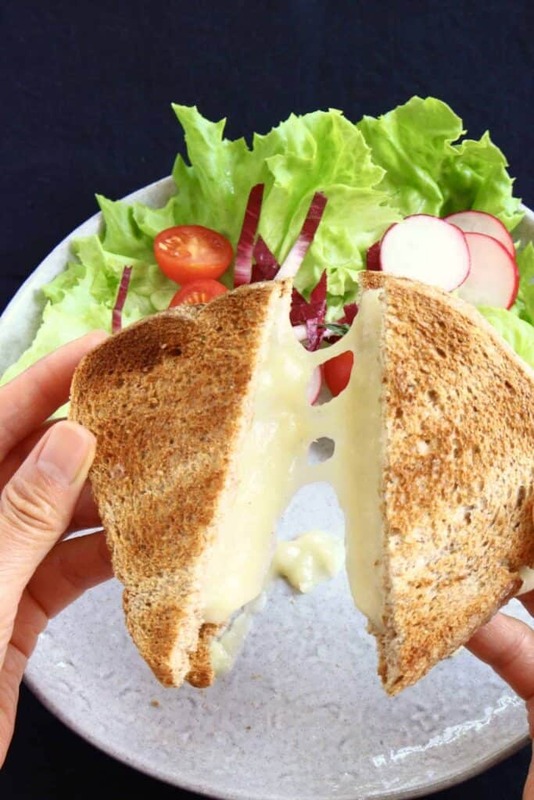 It’s melty, stretchy, sticky, melts in your mouth and is absolutely perfect for sandwiching between slices of warm, crispy toast! 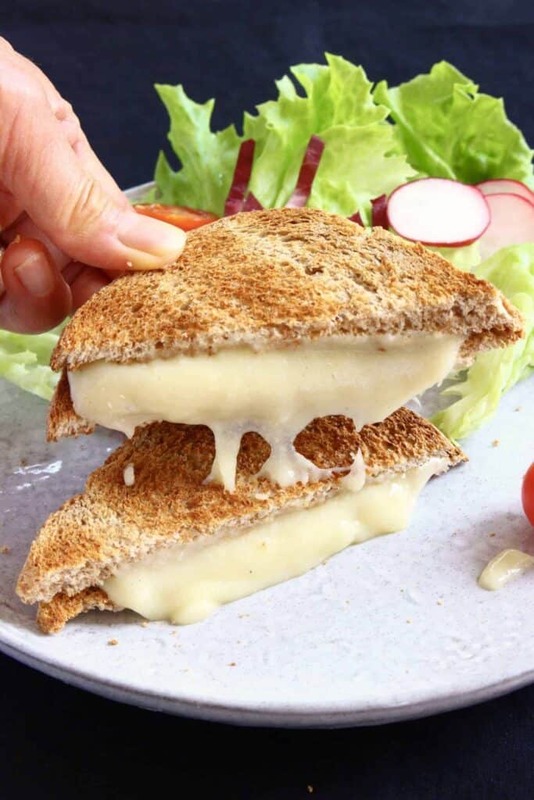 Stretchy Melty VEGAN Grilled Cheese with a magical ingredient! Completely natural, nut-free, oil-free, gluten-free. One word of caution: melted mochi is extremely sticky, so once you have removed the sauce from the pan, please soak your pan in boiling water immediately - otherwise you'll have a very tricky washing-up situation on your hands! Mochi is a Japanese glutinous rice cake and miso is fermented soybean paste. You can find miso in most supermarkets or local health stores, and you can find mochi in Asian supermarkets! I would like to try this recipe. Could you show an amazon link to the correct mocha so that I purchase the correct product, please? I can’t wait to try it! I couldn’t find it on amazon, but you can buy mochi in Asian supermarkets.